A team of University of Hawaii students calling themselves “LoveMilkTea” took first place with a “wayfinding” mobile app for the University of Hawaii at Manoa. HONOLULU — “Wayfinding” was a winning theme as 20 community teams competed at the 2017 Hawaii Annual Code Challenge (HACC) Judging and Awards (a.k.a., “Demo Day”) last Saturday, Sept. 23, 2017, at East-West Center. A panel of judges led by Gov. 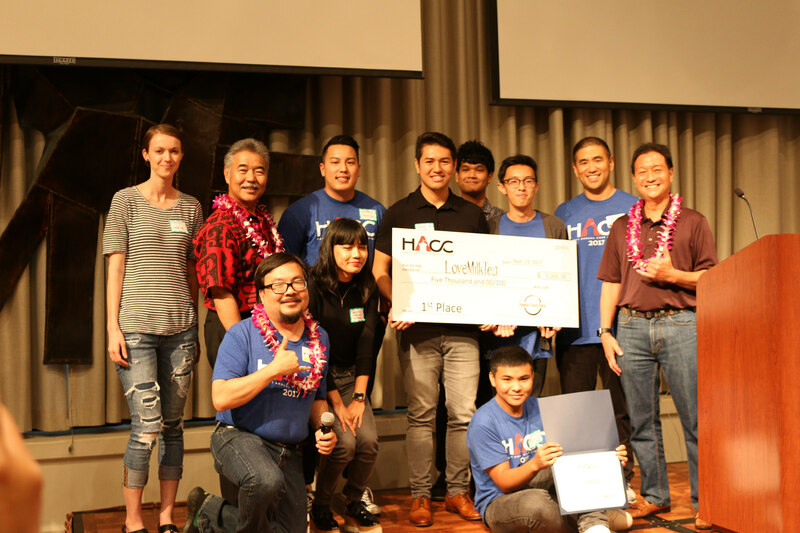 David Y. Ige honored top teams for proofs-of-concept and prototype solutions, developed over the month-long state competition, that help individuals navigate the likes of a university campus, Hawaii state law, and even grant data. A team of University of Hawaii students calling themselves “LoveMilkTea” took first place with a “wayfinding” mobile app for the University of Hawaii at Manoa, which can often be a daunting maze to new students and campus visitors. Gov. 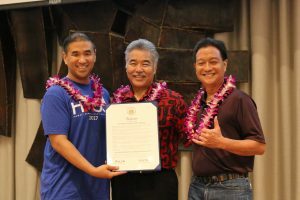 David Ige proclaimed Sept. 23, 2017, “Hawaii Annual Code Challenge Day,” presenting the proclamation to state Chief Information Officer Todd Nacapuy (left) and Hawaii Open Data Executive Director Burt Lum. In addition, certificates of award were presented to community teams “pcotg-v2” (Peaceful Citizens of the Galaxy, Version 2) and “PoweredByRamen,” as well as high school teams “J.E.S.S.” (Kamehameha School Kapalama), “Na Koa” (Kamehameha School Maui), and “Furious-Five” (Punahou School). Gov. Ige also proclaimed Sept. 23, 2017, “Hawaii Annual Code Challenge Day,” presenting the proclamation to state Chief Information Officer Todd Nacapuy and Hawaii Open Data Executive Director Burt Lum. The event coincided with “National Day of Civic Hacking,” part of a nationwide effort led by Code for America to encourage individuals with technology skills to work together to show that government can work in the 21st Century.